This spring dosa is irresistibly delicious which is easy to make with simple ingredients. This is a fusion recipe of South Indian and the Chinese cuisine. A purely vegan, vegetarian, real food and clean eating recipe. 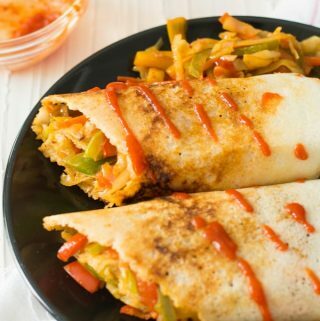 Spring dosa is Indian crepe made with fermented batter and Chinese-style stir-fried vegetables. The vegetables sautéed in the hot sauce and soy sauce. This is amazingly delicious that we cannot stop eating after the first bite. Dosa is made with fermented batter of lentils and rice. This is a vital everyday breakfast menu in South India. Especially this prime food in the state like Tamil Nadu, Andhra Pradesh. However, this is amazingly popular and inherited by the North Indian cuisines as well. 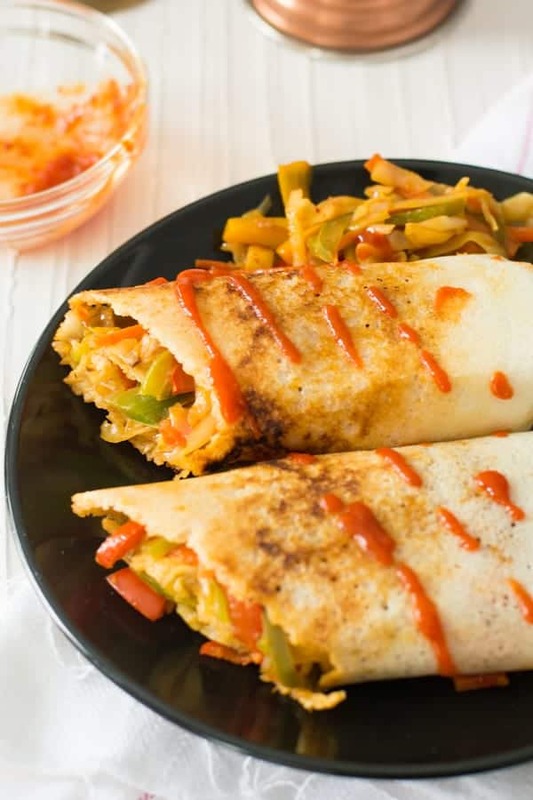 This Chinese style Dosa is also called as Szechuan Dosa or Szechuan masala dosa. And personally, I cannot live without having dosa for at least two to three times a week. This is a Chinese twist to Indian dosa. Rolling the vegetables in the Indian crepe(dosa) instead of spring roll wrapper is Spring Dosa. I would say this is an Indo-Chinese recipe which is now becoming popular on the street-side stalls in India. Due to its recent inclination of popularity throughout India, dosa is taking different avatars in different regions according to the local food and culture. And this spring dosa recently gaining its momentum on the street side stalls. Spring dosa is believed to be developed when customizing spring roll to the Indian liking. When I first tasted it, I was literally overwhelmed with its taste and was thanking the unknown person who developed this. Dosa is considered as a breakfast or a light dinner. Since base’s batter is fermented, this is easy for the stomach to digest. Those who bored with the regular dosa or want to try out exotic food should make this amazing fusion recipe of two different countries. Each bite gives you multiple layers of taste folded brilliantly. If you have not tasted or tried this recipe before, you should give a try. Otherwise, you will be missing is super delicious food that you have never tasted like this one before. Tomato ketchup or sriracha sauce would be the best pair to serve with. But I feel that the Spring dosa is the stand-alone recipe and dosa not require any side dishes to serve with. This can be a great evening snack or a perfect breakfast on the go or a light dinner. When the children return home after the tiresome day, this Chinese spring dosa does magically satisfy their hunger. And a guilt-free dish for both mom and children. If you are planning to have this for the party you can make the filling ahead up to 6 hours. You may add thinly sliced paneer or cottage cheese for making this vegetable dosa. You may add meat to more protein rich. Shredded chicken would be the best meat if you plan to include. Sauté chicken in the garlic first and then add the vegetables. Add mushroom, which makes the filling more authentic and tastier. Slice them to the size of the match stick. Add cooked noodles along with the vegetables. You may use rice noodles or Hakka noodles. Instead of adding these three ingredients red chili paste, soy sauce, and rice vinegar separately, you may use Szechuan sauce. You can make your own, you may refer homemade dosa batter for the tips and tricks. This is a common ingredient among Indian homes. If you do not have it at home, you may get the batter from the Indian store’s freezer section. I have added green, red, and yellow peppers. These vibrant color looks contrast and more appetitive and would be loved by the children for its color combination. You may opt for either one of them or all of them depending on the availability. This gives a beautiful brown color and saltiness to the filling. You can use either light or dark soy sauce. You may use either homemade or store-bought red chili paste. Or you may also use Sriracha sauce as a substitute. But sriracha sauce is too hot and may not be for everyone. So careful while substituting Taste and adjust the quantity according to your spice level. Garlic sauce or red chili sauce is also a close substitute. This the most important ingredient in this recipe. This adds the crunchiness and adds makes the dosa nice and chewy. Carrots are known for their bright color. Not only that, carrot adds beautiful crunchiness to dosa and it makes it more nutrients. A guilt-free ingredient that everyone would agree. I have used sunflower oil. Instead, you may use butter, olive oil or any cooking oil of your preference. This adds super Chinese flavor to the dish. Many ask me whether they can substitute rice vinegar with regular vinegar. Always my answer is rice vinegar cannot be substituted with the regular vinegar. You may skip using it if it is not available. This is the most flagrant ingredient and it blooms up its favor once it’s got sautéed in the oil. Mince the garlic as it blends with the other ingredients, and you will not notice it while chewing. Sauté garlic-Sauté the garlic in 2 tbsp of cooking oil until fragrant. 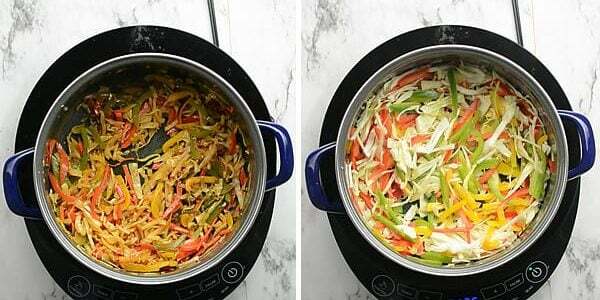 Sauté the vegetables– Add thin julienne cut cabbage, carrot, red pepper, green pepper, yellow pepper. Prepare them before you start the cooking process because the garlic burnt quick in no time. So, keep all the ingredients ready to avoid any disappointments. Sauté these vegetables until it is half done and slightly changes its color. Vegetables need not be cooked completely, half cooked vegetables with the crunchy texture would be great for the spring dosa. Adding the sauce add soy sauce, red chili paste sauce, and rice vinegar. Combine them in high flame until the sauce coats the vegetables. 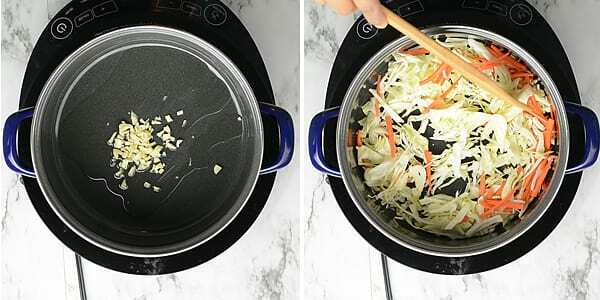 This step will take one or two minutes so always be next to the pan. Set aside-Once you made the vegetable feeling set aside. Make dosa-Heat a flat surfaced pan on the stove, then pour 1/4 cup of batter over the pan. Using a flat spoon spread the batter in a circular motion like a crepe. Add drizzle cooking oil. Cook dosa until the bottom becomes golden brown. Start Filling-Take a spoonful of vegetable mixture and spread evenly over the dosa. Using ladle roll and cut into half. And serve immediately. Serve with tomato ketchup or sriracha sauce. 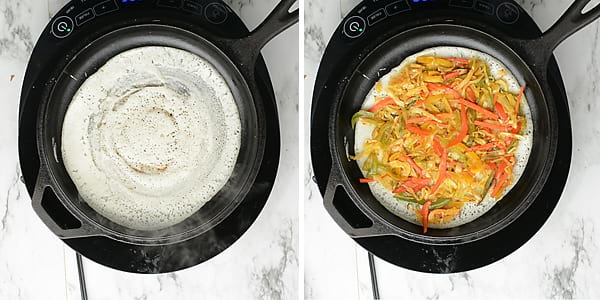 Spring dosa is Indian fermented crepe made with Chinese-style stir-fried vegetable filling. The vegetables sautéed in the Chinese sauce. This is amazingly delicious that we cannot stop eating after the first bite. In a pan add garlic and saute until it changes its color slightly. Add cabbage, carrot, red pepper, green pepper, yellow pepper, and saute until it half cooked. Add soy sauce, red chili paste, rice vinegar. In the high flame, saute for few seconds until the vegetables coated well with the sauces. Heat flat surfaced pan on the stove. Add 1/4 cup of dosa batter, and using flat spoon spread evenly in a circular motion. Drizzle cooking oil. And allow it to cook until the bottom turns golden brown. Start spreading the filling evenly over the dosa and then make a roll. Cut into two halves and serve immediately. You can make the vegetable mixture a day before and keep it refrigerated and you may use it whenever you need it. You may also add rice noodles or Hakka noodles for more filling.